Prerequisites: Flat or tubular peyote stitch. 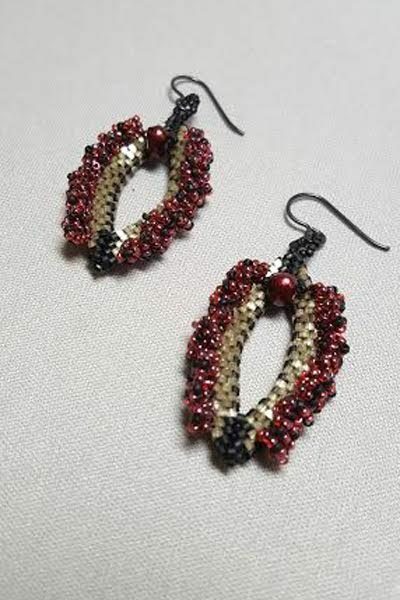 These earrings are meant to celebrate female sexual anatomy. Use your peyote stitch skills to make a marquise base with Myuki Delica beads. Then use Toho beads to create ruffles. Add a pearl in just the right spot. Participants will make one earring in class. Use memory wire to make a 2-stranded cuff bracelet. 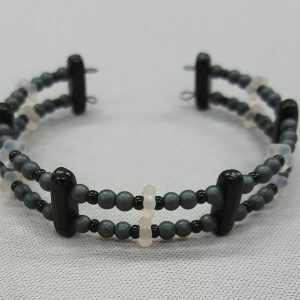 Use a 2-hole bead or spacer bar to connect your two strands. Learn to use memory wire tools to make loops on the ends of your cuff. This is a great way for people who normally don’t wear bangles to get a bracelet style without a clasp that fits properly. Learn herringbone, or Ndeble stitch, a fundamental stitch used in many contemporary bead books and magazine projects. 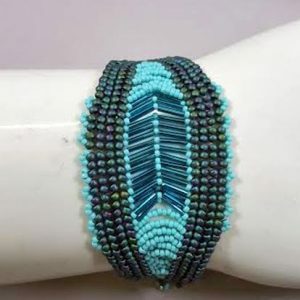 Participants will use Toho seed beads and bugle beads to learn to increase to make their piece wider in the middle and how to decrease to bring the end of their cuff down to the original width near the clasp. The end result is a fun and fast beaded cuff bracelet. 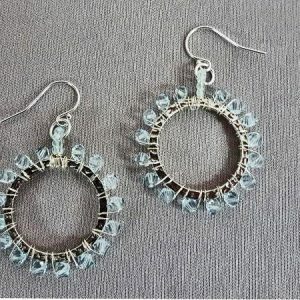 Take sterling wire, Swarovski crystals, and a hammered silver ring to make a pair of earrings. Learn wire wrapping techniques to create this contemporary style of earring. Fast and fun.